Which Is the Best Deodorant That Doesn’t Stain Clothes? Home » Beauty Care » Which Is The Best Deodorant That Doesn’t Stain Clothes? 1.1. How to get rid of deodorant stains or marks on outfit quickly? 1.2. How to prevent deodorant stains and marks on clothes? 2. Which is the best deodorant that doesn’t stain clothes? After spending hours on choosing a perfect outfit, you instantly ruin it since your deodorant is leaving white stripes behind. Although you can change another costume, you have to use it to deal with issues related to body odor. So, what can you do to stop it? Should you look for the best deodorant that doesn’t stain clothes? Of course, yes. Since you are here, we will show a list of necessary products. And after learning each carefully, we believe that you can pick up the right deodorant that doesn’t stain clothes anymore. Before studying about the deodorant that doesn’t stain clothes, we think that you need to know why your product is causing this annoying trouble. As you know, deodorant or antiperspirant is an indispensable part of your grooming room, though both have some specific differences. You can study WHAT’S THE DIFFERENCE BETWEEN DEODORANT AND ANTIPERSPIRANT here to know more. Now, back to the white marks on clothes while using the deodorant! Why do they occur? Indeed, the main culprit is aluminium chlorohydrate. It’s the organic chemical used to reduce perspiration and close pores . Also, how you use deodorants is as important as what you use. What does it mean? Let’s think! You often spray or roll and then instantly slip into the clothes, don’t you? This action might be normal, but it contributes to creating the white streaks. Most of the aerosol sprays suggest you hold the nozzle around 15 cm away from your skin. In case you’re using the roll-on deodorants, make sure you leave it dry before wearing clothes. Besides, don’t forget to do an underarm topiary to lessen residue adhesive to the pit hair. Well, is there any deodorant that doesn’t stain clothes in this case? Keep following us and you will find out now. How to get rid of deodorant stains or marks on outfit quickly? If you don’t buy a new deodorant that doesn’t stain clothes or BEST DEODORANT FOR MEN in time, you can consult some quick and easy tips here. Take a pair of knee highs or pantyhose to rub the deodorant residue smudges or marks. But, avoid heavy scrubbing and just apply some fast-moving action with your wrist. Make use of foam rubber from the hanger to rub them. Using a new or used fabric dryer sheet is effective in eliminating all stains of deodorant. Usually, the used sheet will be better since the new one might leave some white marks on dark fabrics. Note that the sheet has to be dry before using, and you should rub it with short and quick strokes. In case you cannot find anything, the last solution is to rub the fabric together against itself to release the deodorant residue. After that, brush it away. However, this way might leave wrinkles and even snag or stretch some delicate fabrics. Always remember to rub the stain with a dry textured material that can release the residue from your clothes without hurting the fabric. How to prevent deodorant stains and marks on clothes? After saving yourself from this embarrassing situation, we believe that you’re looking for ways to stop that from happening again. Allow us to support you at this time! Remember to apply the deodorant from a distance. After applying deodorant to your armpits, you should let it dry entirely before putting on clothes. In case you need to increase the process, using a hairdryer is also useful. Or simply use deodorants that doesn’t stain clothes (we will mention in the next part). HOW MUCH DEODORANT SHOULD I USE? Don’t apply too much because if it’s not working, you can change another one. Instead of availing a solid white product, you should switch to a clear gel deodorant formula or opt for the aerosol sprays. It’s because both can reduce the marks on clothes better. You can use an undershirt to stop staining the outer shirt. In case you have to pull a T-shirt or dress over your head, keep in mind to roll up the bottom hem upward before wearing. After that, unroll the hem to hide any deodorant mark inside where nobody can see it. In addition, some suggest you should wear clothes before using deodorant. Although it might prevent deodorant marks, you also leave lots of residues on your underarms. And this results in odor and likely staining . Catching the white marks on clothes after using deodorant is truly an embarrassing situation. Of course, you can deal with them by following our tips above. But, why don’t you choose a right deodorant that doesn’t stain clothes? Here are the top 6 best products available in the market that you should know. 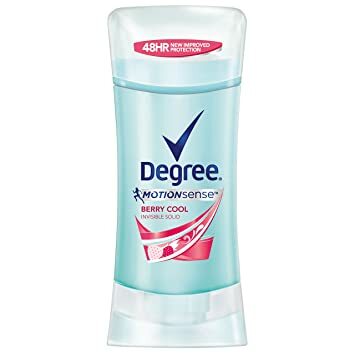 Degree is a famous brand of the best deodorants on the market. And if you’re looking for the product that won’t stain your outfit, Degree Dry Protection Antiperspirant, Berry Cool will be your best choice at this time. So, why do we affirm this product as the good deodorant that doesn’t stain clothes? Thanks to an innovative MotionSense technology, a set of microcapsules will sit on the surface of your skin. When you move, friction will break these tiny capsules and release a fruity scent. And that aroma will keep you fresh and confident all the times. No matter where you spend your day in the gym, office or outdoors with friends, this product helps you free from odor and stay fresh. Of course, you don’t worry about any white marks or stains on clothes. It’s because the more you move, the more fragrance release to protect. Additionally, this product offers an easy application since you just turn the dial on to raise the stick and apply a moderate layer to your underarms. After that, everything will be set. Relying on that, you can save more time while still having a peaceful mind . To be known as the world’s leading natural mineral salt deodorant, CRYSTAL BODY DEODORANT is a favorite deodorant that doesn’t stain clothes. Also, it’s safe for your underarms. Plus, it prevents your body odor thanks to an invisible protective barrier against odor-causing bacteria. Made from the mineral salt and no harmful chemicals like aluminum, this product will create a hidden layer of natural protection on your skin when you apply it. Besides, it includes zinc gluconate and benzoic acid that are famous for preserving qualities and fighting against odor. Since the CRYSTAL BODY DEODORANT is tested by dermatologists, you’re guaranteed to use it not only under your armpits but also your thighs or chest, the bottoms of your feet, and anywhere you smell body odor. Especially, this product has a non-sticky formula. So, it quickly dries without leaving any stain on clothes. If you’re not interested in scent, this product will be ideal since it’s unscented. Also, please keep in mind to use it after washing your armpits, or it won’t work effectively. 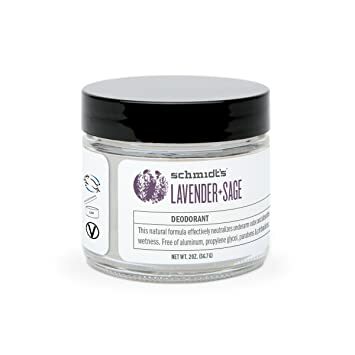 Another great deodorant that doesn’t stain clothes is Schmidt’s Natural Deodorant, Lavender and Sage. With a soothing and pleasing smell of lavender and sage, this product does not only balance odor but also offer an enduring aroma that is prominent. Since it’s a natural deodorant, you will find no aluminum, phthalates, propylene glycol, parabens, and other chemicals. Thanks to a cream form, you can apply it with your fingers. Moreover, it easily blends into your skin without leaving any stain or stickiness. What’s more, this product includes baking soda and arrowroot in order to keep moisture under control. That means you’re totally confident when wearing Schmidt’s Natural Deodorant without worrying about the appearance of annoying white marks. As a newbie to the cream form, it’s best to use a spatula to take a small amount for covering your underarms or removing the cream if it’s too much. And this way makes you feel civilized. Instead of including baking soda like other deodorants, nasanta Magnesium Deodorant, as its name suggest, soaks with magnesium hydroxide. For deodorant aims, this white crystalline powder helps to balance body odor while permitting you to sweat naturally. Just note that sweating naturally doesn’t mean that this product will stain your clothes. Since it holds no aluminum, parabens, even essential oils and talc, you don’t have to worry about the annoying marks or stains on clothes. Moreover, it won’t take long to dry after applying. 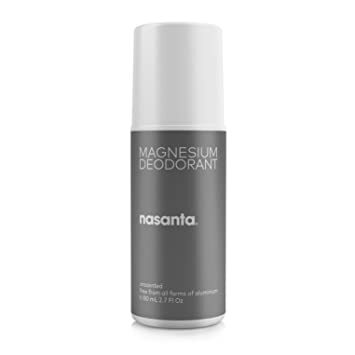 Especially, if you have the sensitive skin, nasanta Magnesium Deodorant is totally suitable because it was experimentally-tested for its level of sensitization. Besides, it’s free of provoking chemicals like alcohol, baking soda, etc. Read here to know more BEST MEN’S DEODORANT FOR SENSITIVE SKIN. Additionally, if you’re not a fan of noticeable and robust aroma, this deodorant will be for you because it’s unscented. Without essential oils, it is suitable for those who have a sensitive nose as well as good for others alongside you. 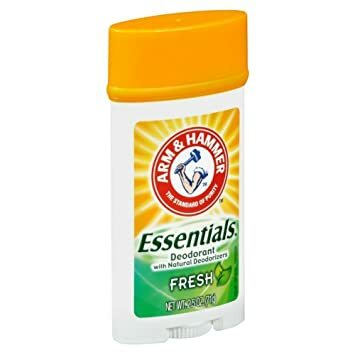 The next product in the list of the best deodorant that doesn’t stain clothes is ARM & HAMMER Essentials Natural Deodorant Fresh. First of all, you should know that it’s a deodorant, not antiperspirant. Although it won’t obstruct pores or prevent sweat, it comes with a reputation of the best deodorant with remarkable longevity. When applying to your underarms, it will instantly sink into hairy pits that help to prevent odor without leaving any tracks or staining your clothes. Additionally, without unnatural ingredients such as aluminum, castor oil, alcohol, colorants, and parabens, you won’t see any unsoiled marks after using. The ARM & HAMMER deodorant boasts its natural and fresh scent that can stay around longer than any products. As a plus, this product is suitable for those who have a sensitive skin thanks to its natural ingredients and baking soda. 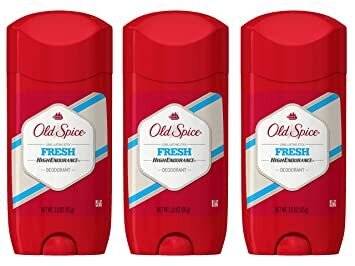 The last deodorant that doesn’t stain clothes we want to mention is Old Spice High Endurance Deodorant for Men. This product doesn’t blend with any bacteria since it eliminates bacteria. Besides, the 24-hour odor protection gives a great smell all day. So, no matter where you’re going to like to the gym or hanging out with friends, you’re always guaranteed to prevent foul-smelling agents. In addition, when applying to the underarms, the smooth and blue-gel stick will slip cleanly over skin and hair. Plus, it includes no alcohol and aluminum that are the main factors for creating stains on clothes. That’s why you have no worry about stains, clumpy hairballs, or powder-cake. Another fantastic thing is that this product offers a 3-ounce stick with a pack of 3 that is larger than the others. And its price is rather affordable for those with a low budget. Which is the best deodorant that doesn’t stain clothes? With the top 6 products above, we think that you can select the good one for yourself. Just consider how much you can pay, which scent you want, how it reacts to your skin, etc. And then you easily opt for the perfect product. Of course, you don’t worry about any white marks on your outfit whenever applying the deodorant. Aside from choosing the right deodorant that doesn’t stain clothes, don’t miss consulting other articles about BEST ALUMINUM FREE DEODORANT FOR MEN, BEST DEODORANT FOR MEN WHO SWEAT A LOT or BEST DEODORANT FOR SENSITIVE ARMPITS if you’re interested in the deodorant products. Or in case you still want to know more about this topic, don’t mind contacting us by leaving your comments here. And click on buttons below to SHARE it to those who truly need it.